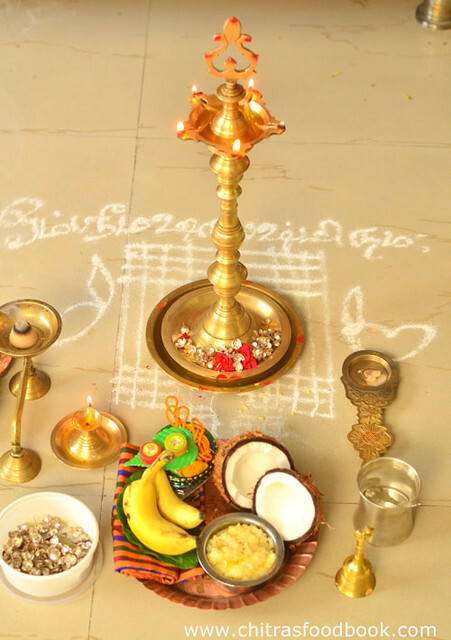 This post explains a simple method of how to perform Mahalaxmi puja / Thiruvilakku Pooja every Friday at home.I have included Puja vidhi/ pooja procedure, slokas, mantra and songs required in Tamil & English. I have given a simple Lakshmi pooja method for working women and a detailed procedure with 108 potri for housewives. I have also shared a downloadable PDF format for Lakshmi Pooja slokas, mantras in Tamil. Please download it by clicking the link. 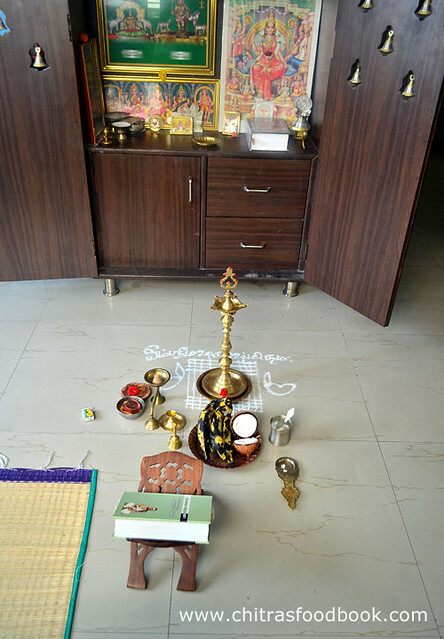 In South India - Tamil nadu, most of the housewives do this thiruvilakku poojai regularly at home in a simple way by chanting 108 potri. 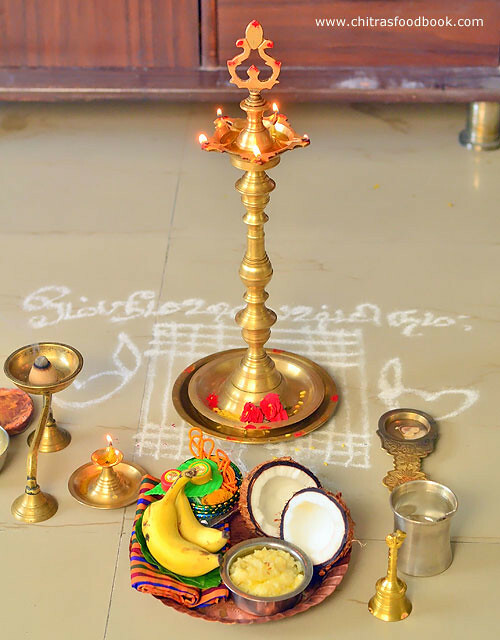 We worship Goddess Mahalakshmi in the lamp and perform this pooja.When I posted Friday neivedyam recipes, my readers requested me to share our Pooja vidhanam with Ingredients needed, Pre-preparation, Pooja kolam/Rangoli, songs in a detailed manner just like my other festival procedures post. Few readers wanted me to share a simple pooja that helps working women and busy moms. So I have shared the pooja procedure in two ways by referring my Friday pooja book in Tamil.One is a very simple version( Panchopachara pooja) that hardly takes 5 to 10 minutes to do it. It would be ideal for working women to do it either in the morning or evening around 6 pm. Not just on Friday, you can do this pooja everyday. The second one is my family’s traditional way with 108 potri which I learnt from my MIL. Some people make it in an elaborate way by keeping kalasha. If you are looking for the authentic Mahalakshmi pooja vidhanam with shodasha upachara puja, please refer my in-laws blog – Learn kolam. I have shared it in detail. Basically Lakshmi puja is performed by married women seeking long life for their husband, health, wealth, peace of their family.This pooja gives us immense benefits if done whole heartedly with full faith.In North India, this puja is performed during Diwali in a grand manner. Today I have shared this post mainly for beginners and newly wedded girls. I have also mentioned the benefits and significance of this pooja. I have shared all the pictures from my pooja room. Hope it would be useful for you all to get some ideas. When I was young, I have seen Thiruvilakku pooja performed in Amman temples & Murugan temples in Tamil nadu. But I never thought it can be performed at home till my marriage. I came to know about it from my MIL. She used to do this pooja every Friday at home. Initially I was just a listener sitting along with her and watching it. After 5 years of my marriage, I started doing it on my own by following her method while she continues to do it in our Salem house even at this age. After buying our own house, I performed Vaibhava Lakshmi pooja by keeping Kalasam for 11 weeks as advised by my neighbor. Its an elaborate pooja just like Varamahalakshmi festival. So I will share it later.In this post, we will see how to do Friday Mahalakshmi pooja at home in a simple way without keeping kalasam/Kalasha. As usual, this post would be very lengthy as I have given all the sloka in English and Tamil.So please bear with me. If possible. I will try to make a separate post in Telugu and Hindi with the help of my friends and try to make a PDF of them in near future. Thanks for visiting this page. If you find this post helpful, please share a few words in the comment section which will make me happy. Click THIS LINK to download the PDF format of sloka, mantras in Tamil. Mahalakshmi pooja is performed by married women or young girls at home seeking health, wealth, harmony and long life for their husband, removal of sins and black magic. By doing this pooja, It is believed that Lakshmi, wife of Lord Vishnu and the Goddess of wealth visits her devotees house during this pooja and bless them with abundant wealth and good health.Goddess Lakshmi prefers clean house. So devotees clean their houses, decorate them with lights and flowers, prepare sweet delicacies/neivedyam as offerings and do the pooja. We believe that when the God is more happy at her visit, we get more blessings from her. Lakshmi pooja can be done performed by a single person or by a group of ladies at home. It is considered to be more auspicious to do this pooja on Pournami day( Full moon day). People can get various types of benefits if they do it in Tamil months from Chithirai (April) to Panguni (March). Chithirai : Blessed with increased production of Pulses. Maasi : Blessed with removal of sins. 11. Match box, Plates to keep fruits, coconut. 12. If you wish, you can keep a set of blouse piece, bangle, turmeric piece(Virali manjal), small mirror, comb, black chain(Karugamani), kumkum packet etc. Please refer the above picture. 13. I have 108 silver flowers which I use it for archanai. Please check the picture given above. You can use uthiri poo/ flowers instead. On the previous day i.e Thursday night, Sweep the house clean. Wash all the lamps and pooja accessories.Dry them and decorate it by keeping sandal and kumkum dots. You can draw kolam in the entrance on previous day night of you wish. Please visit my in-laws blog Learn Kolam to get some padi kolam ideas. Mostly we do this pooja in the morning before Rahu kalam ( 10.30am to 12 noon) or yamagandam (3:00 pm to 4:30pm) on Friday. So we do it around 8 to 9 am after sending the kids and husband to school & office. It is also auspicious if you do this pooja in the evening around 6 pm. So keep all the things ready before pooja timings. A. Near the pooja room, draw a kolam/rangoli on the floor. 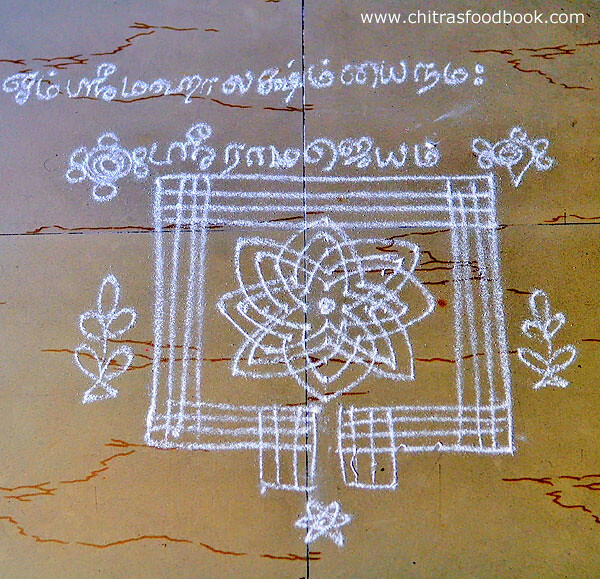 You can draw either maakolam( Kolam with wet rice flour paste) or with usual rangoli powder. My MIL draws padi kolam with hrudaya kamalam in the center. But I draw padi kolam with a simple flower kolam in the center as I am not good at drawing hridaya kamalam kolam .Please visit my in-laws blog Learn Kolam to get ideas on padi kolam. Place the wooden plank or peeta over the kolam. Keep the lamp on the plank or peeta. Lamp should always face the East or North direction. South & west should be avoided. Make sure you leave some space around the lamp for Pradhakshinam ( circumambulation).Please refer the above picture for pooja arrangements. B. Decorate the lamp, idols with flowers.Garland it if you wish. Keep sandal & kumkum dots. Add gingely oil/ sesame oil or ghee generously.Lamp should not go off while doing pooja. So add more oil before starting the pooja. Put 5 wicks or minimum 2 wicks in the lamp. C. Decorate the idols and photo frames with flowers. Some people keep kumkum dots for all the photo in pooja room every Friday. But I do it only for festivals. Prepare the neivedyam. Mostly I make Payasam/Kheer or sweet pongal/ Sakkarai pongal in pressure cooker as sweet pongal is meant to be the favorite for Goddess.You can also make Ven pongal, rava kesari or sweet dishes with aval/poha and jaggery. I will try to make a separate post for neivedyam ideas soon. 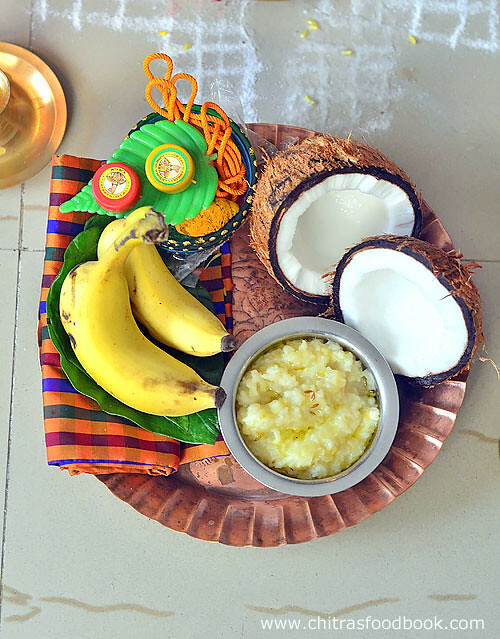 D. Place the neivedyam bowl, broken coconut, banana, betel leaves & nuts in a plate or banana leaf. Place them in front of the lamp. E. Keep the incense stick in the stand. Do not pierce it over the banana. Place the sambrani/dhoop stick in the stand or thoobakal. Keep some ash(viboodhi/thirueeru) in the camphor plate and place the camphor over it.If you don’t have a plate to place camphor, you can keep it over the betel leaf or banana leaf. Do not use the betel leaf which you have kept for neivedyam. F. Place a mat for you to sit in the side of lamp. We call it as Thadukku in Tamil. Keep all the sloka books nearby.You should sit facing North or East. Avoid facing south. This method is for people who have very less time in hand for doing pooja. It would be ideal for working people. This is called as “Panchopachara Pooja” ( Five fold worship). In fact, this pooja can be performed everyday. You can do this pooja by standing in the pooja room.No need to keep the lamp separately in a peeta or plank. If you do not have the offerings/ pooja items in hand, you can do manasa pooja. ie. Assume that you are offering all the 5 things.The second method is by offering all the 5 in real. 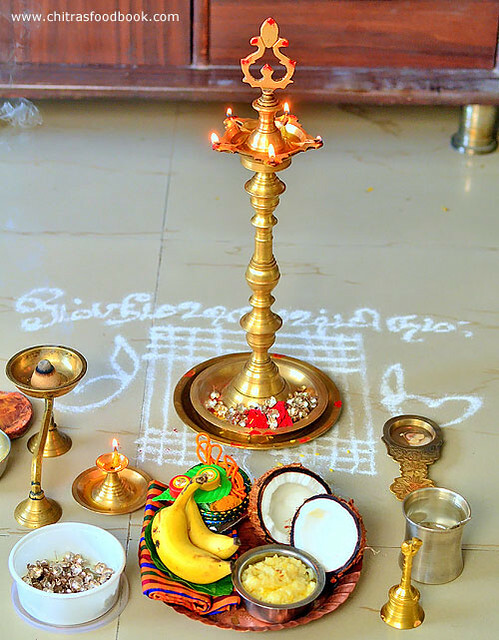 If you have prepared any neivedyam recipe, you can keep it in a plate in front of the lamp/Thiru vilakku and do this pooja and offer sandal paste, flowers, dhoopam, dheepam, neivedyam and mangala harathi/Karpooram. Finish the Pooja by doing namaskaram in front of the God. Click THIS LINK to download PDF format of sloka, mantras in Tamil. Do this pooja in the morning before rahu kalam OR do it in the evening around 6 pm.Light all the lamps other than the one you have kept for pooja because we should light the main lamp only after reciting Ganapathi sloka. Basically any pooja should be done by worshipping Lord Ganesha at the beginning.So vigneshwara pooja is to be performed by reciting Lord Ganapathi slokas. So lets start with Ganapathi song. I have given all the mantra and songs in Tamil and English. Continue this with Thiruvilakku Archanai (108 potri). You can chant thiruvilakku Ashtothram in Sansrit or Thiruvilakku archanai song in Tamil with 108 potri which I have given below. We offer flowers( uthiri poo) or kumkum in the feet of lamp while chanting this potri. You can offer a combination of 54 flowers & 54 kumkum archanai.I use my 108 silver flowers for this. Please check the image given above ingredients section. 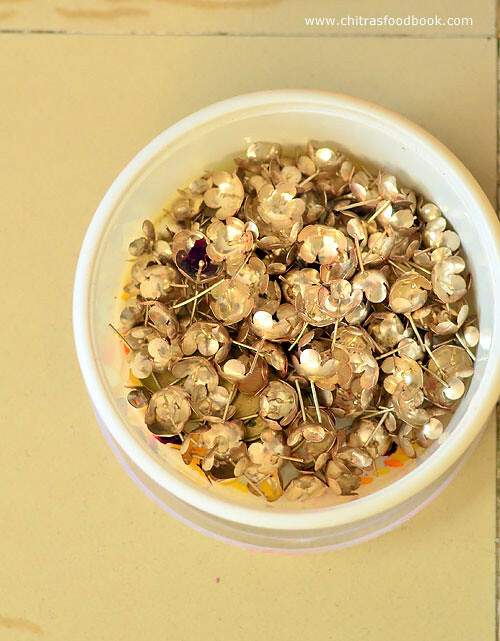 You can buy this silver flowers & golden flowers in all jewelry shops. Click HERE to listen Thiruvilakku Archanai sthothram in Sanskrit. After archanai, chant the following lines and offer the sandal paste in the feet of lamp, offer flowers, show the dhoopam, dheepam. Do the neivedyam and finally mangala harathi/Karpoora harathi. Finish the pooja with devi vaazhthu. Saranye tryabike devi, Narayani namosthuthe. Lastly do the pradhakshinam( circumambulation of lamp ) – 3 times and do the namaskaram in front of the pooja place. Move the lamp slightly towards the east. This shows the end of pooja. 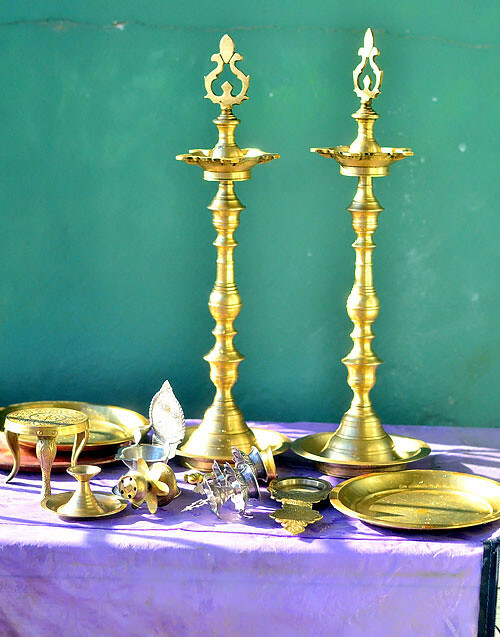 Now you can offer kumkum and thamboolam prasadham to the married ladies and young girls if you wish. Quell the lamp with a flower.If you have offered kumkum for archanai, you can keep it on your forehead and mangal sutra for daily use.Take the flowers used for pooja and put it in a flower pot.Pour the water in tulsi plant or any other plants. Meaning : If one offers me with love and devotion a leaf, a flower, a fruit, water, I will accept it. DISCLAIMER : I have shared the pooja methods based on my family’s tradition. Please consult your elders in family, change it and follow as per your custom. Hi chitra very informative post.keep up the good work. Hi please share the Vaibhav Lakshmi puja procedure too.i want to know about it. I was always wondering if I could perform Pooja like my mom every Friday. As a working women it was always difficult. Thanks for the simple method. Hi chitra, thanks for sharing about friday pooja.. very impressive to see the step by step method given to us like a mom to child.. nandri!!!! I was always wishing to do lakshmi pooja...but didnt do it as i didnt know the proper procedure.Your post really helpful.Thanks much dear.God bless you..
thanks for sharing. have been searching for this. clearly explained. Goddess Mahalakshmi bless u dear! Thanks for sharing the Lakshmi Puja Procedure. It is very impressive post by explaining the step by step procedure. Yes, you can. Start a website and post good quality content consistently. Share them in social media pages. Sure you will win in sometime ! Thank you for sharing pooja procedures.. I followed ur janmashtami pooja n really grateful to you. God bless you n ur family. Thank you for sharing the details. I followed ur janmashtami pooja and I'm grateful to you. God bless you n ur family..
Mam I am Sindhu...always refer your site for doing all pooja procedures. Hi Sindhu, Glad to know that you follow my post for pooja. We made this pooja room from a carpenter by telling the design. It's 7 feet high and 3 feet broad.